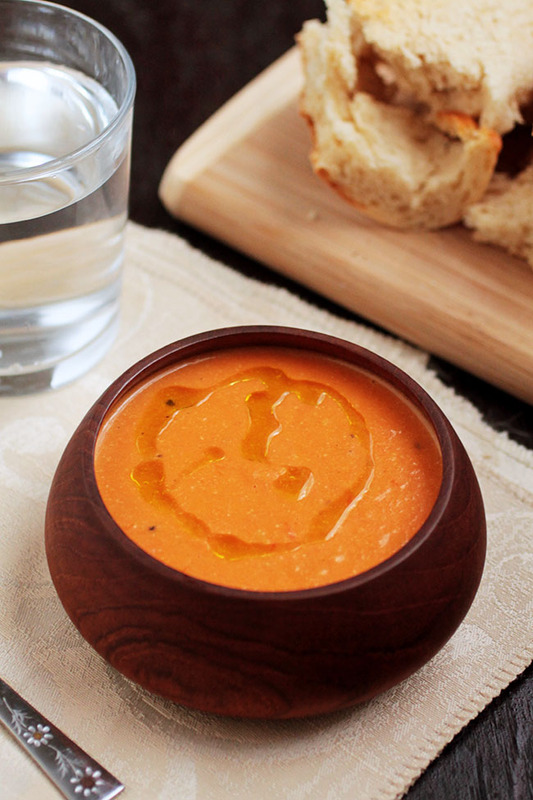 This quick and easy soup is perfect for chilly fall days! Simple, seasonal ingredients and ready in under an hour. Vegan, Vegetarian. I’m not entirely sure that I’m ready for soup weather. Sure, it’s nice when I’m able to start busting out my boots and sweaters again. And sure, it’s nice to be able to turn my oven on without turning the entire apartment into a sauna. But it’s always so hard to say goodbye to summer produce. Especially when the food blogosphere jumps back on the pumpkin train and you feel like you’re hanging on to summertime all by your lonesome. I’M JUST NOT READY FOR PUMPKIN, YOU GUYS. Fortunately, I have eight whole days of summer left. And I’m going to eat as much summer produce as I can get my hands on. Even if chilly weather forces me to put that produce into soup. And speaking of soup, THIS ONE RULES. 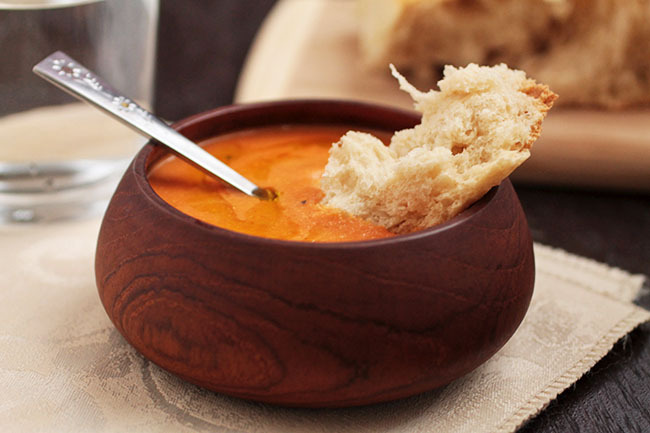 Confession: I’m not really a tomato soup person. Never have been. I think it’s because so much of the tomato soup I saw as a kid came from cafeterias and cans, which meant it was BASICALLY just tomato water which meant YUCK. But over the last couple of years, I’ve been a little more open to the idea. I’ve even ordered it INTENTIONALLY once or twice (GASP). This soup is the perfect end-of-summer, start-of-fall soup. It’s simple and easy to make, and it’s hearty and warm without being heavy: just what I needed to help me get ready for fall. 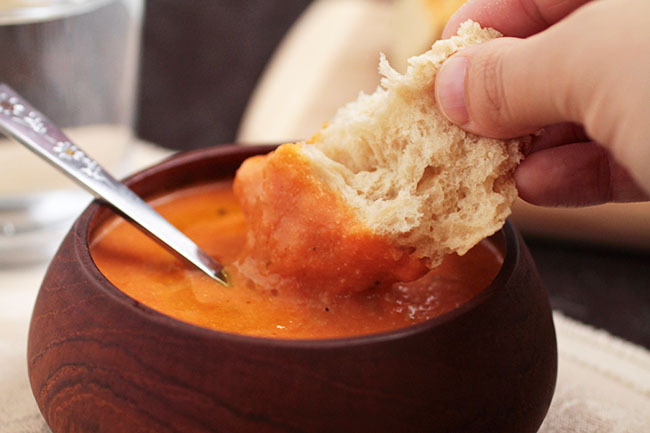 The apple in this soup is kind of amazing – it lends a nice, bright flavor without overpowering the tomato. Hit it with a drizzle of extra virgin olive oil to garnish and serve with a hunk of crusty bread or a grilled cheese for maximum deliciousness. Add onions and garlic and sauté until onion is translucent, about 3 minutes. Add apples, tomatoes, bay leaves, salt, and pepper to the pot and stir to combine. Cook, uncovered, until tomatoes have begun to break down and apples are soft and cooked through, about 30-45 minutes. Remove pot from heat and remove the bay leaves. 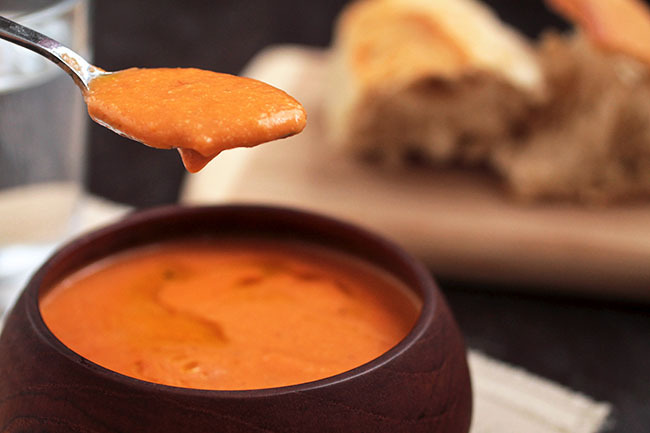 Blend soup with an immersion blender until creamy, being sure to blend away any chunks so you have a smooth consistency. Add milk to soup and give it another zap with the immersion blender to blend everything together. Taste soup and add seasoning if necessary. Serve immediately and garnish with a drizzle of extra virgin olive oil. 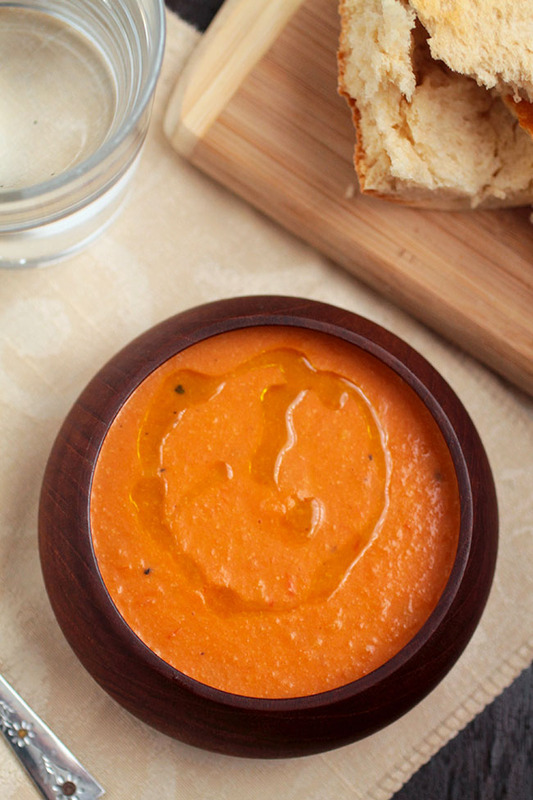 If you don't have an immersion blender, you can also transfer soup to a blender in batches and blend until smooth. I HIGHLY recommend getting an immersion blender if you don't have one - it is hands down one of my top 5 favorite and most-used kitchen tools. You can find great ones at decent prices on Amazon! If the soup, once blended, is too thin, return it to the heat and let simmer an additional 15-20 minutes or until it reaches your desired consistency. 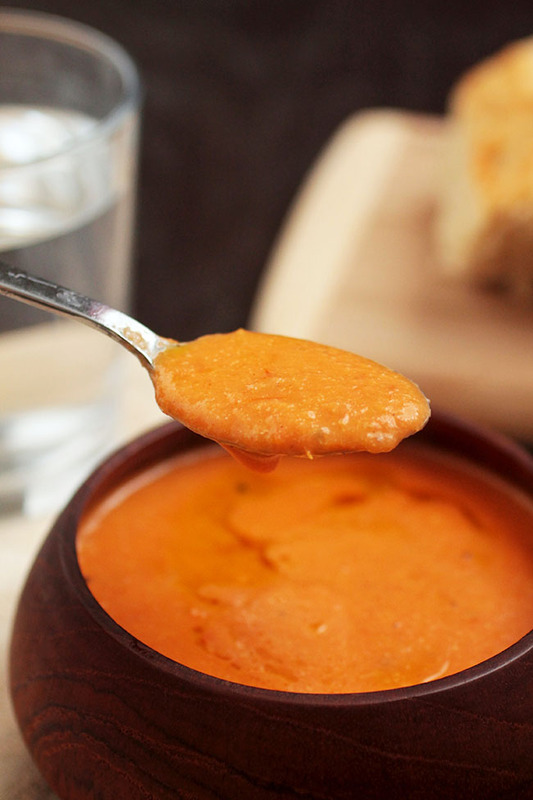 Also, this soup is the bomb dot com with a facefull of grilled cheese. Sounds yummy. Will try and let you know how it turns out. Hello Linda, thanks! How did it turn out? Hi Jessie, I just found your blog and I love it!! I’m pinning about a million of your recipes, and your vegan jambalaya is cooking up right now. I feel you on the pumpkin – honestly, I’ll be more excited about Christmas peppermint 🙂 Thanks for sharing all these amazing recipes! Oooh, this sounds so good. Also, I am right there with you on not being ready to let go of summer just yet. Fresh summer produce is the BEST! Plus, I’m a wimp in the cold.